It's been awhile since my last post, I was little bit busy this week,I hope everyone still enjoy the summer weather for the rest of season. Fresh sweet corn is cheaper in the summer time,I like to use them as ingredients of my cooking. I made shrimp corn fritters,simple and easy ! spoon the batter into hot oil,fry about 2-3 minutes each side until golden brown. transfer to the plate lay with paper towel. Hi Ridwan, I would certainly have added SHRIMP to the title...cannot leave something so amazing out of the 'shout out' as the combination of my all time favorite! Nice and I can see that you have added spices inside. I am imagining dipping the fritters into some chili sauce and yum into my mouth. Btw, I am not what when wrong with the posting of your lamb recipe. I have made the amendment and added the missing part. Thanks for the idea " Shrimp corn fritters " I already change on the title :) Thanks..
Salam Ridwan, in Malaysia we call this Jemput-jemput jagung dan udang'. Look delicious, dip with sauce will make it more tastier. Suitable for Iftar. You definitely had me a "fritters"! Corn fritters are a favorite of mine and I love your addition of shrimp. Gotta try these! I love a good fritter and this is a good fritter! Haven't tried this combination, Ridwan. But I love squash and shrimp fritters. Corn and shrimp fritters sounds equally good! 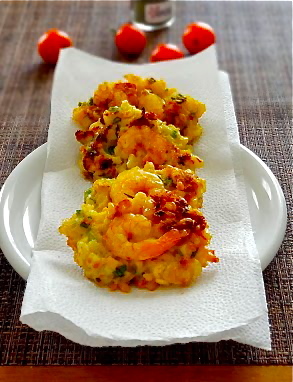 I love corn fritters and I bet shrimp just makes them that much better! Sorry if this a repeat comment... I don't know if the first one took.